Powers/Abilities: Immensely strong and durable, Qnax is an amphibious reptilian, able to survive on land or under water and swim at great speeds. He has gills, webbed and taloned digits, and dense red scales. He is highly-trained in armed and unarmed combat. He has experience with warp and interstellar flight technology. Qnax occasionally uses spears and swords. Qnax is a member of the extra-terrestrial race known as the Xantareans. He was created through centuries of selective breeding to be the greatest warrior in all of the known galaxies. He was engineered off-world and had an extensive period of training. (Tales to Astonish I#73/2-74/2) - Qnax was then sent on a mission to retrieve the greatest treasure in the universe, the Ultimate Machine, aka the Sphere of Ultimate Knowledge, which was located on Watcherworld, the home planet of the Watchers. 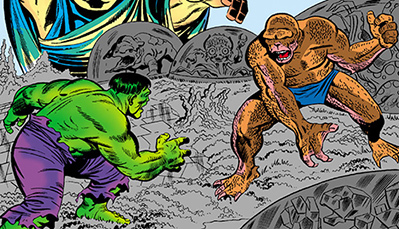 Upon arriving on Watcherworld, Qnax found he had a competitor for the Sphere: the Hulk, who had been sent by the Leader to retrieve the Sphere for his own purposes. Qnax sought to prove his superiority over the Hulk, but as the Hulk got madder and stronger, Qnax found himself outmatched and defeated. The Hulk threw the defeated Amphibion into orbit, but Uatu, who had overseen the struggle, teleported the defeated warrior back to his home planet. (Incredible Hulk II#472 (fb) ) - Returning to Xantar, Qnax was shocked to find that his journey had taken years, and his world had been overrun by chaos in that time. The Grand Xantarean Council of Elders had hoped that the success of Qnax's mission would provide them with the tool and means to return order to their civilization. When Qnax questioned their decision to send him across the cosmos on false pretenses, the Council judged him to be arrogant and a heretic, and sentenced him to permanent exile from Xantar. (Incredible Hulk II#270 (fb) ) - Qnax attempted to compensate for his losses by honing his fighting skills against warriors from world after world. In these struggles, he was uniformly victorius. (Incredible Hulk II#269 (fb) - BTS) - Empress Daydra of the Sagittarians recruited Qnax, along with Torgo of Mekka and the Dark Crawler to help defeat the Abomination, who was serving the Galaxy Master. The Galaxy Master had doubled the physical power of the Amphibion, and he proved capable of defeating all three warriors. (Incredible Hulk II#271-272) - Qnax and his allies, calling themselves the Hulk-Hunters, traveled to Earth in search of the Hulk, the only being who had ever defeated the Galaxy Master, to assist against both him and the Abomination. As always, their purpose was misconstrued. 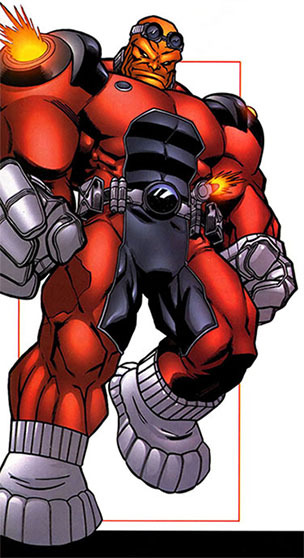 Qnax, still spiteful after his previous defeat at the hands of the Hulk, exacerbated things by antagonizing the Hulk, and escalating things into a full battle against him. Empress Daydra brought a halt to the battle and convinced the Hulk to join them. Qnax continued to hold a grudge, and his ego would not allow him to live down his defeats by the Abomination and the Hulk. A second fight had between he and the Hulk had to be broken up before they could pursue their assault on the Galaxy Master. The Hulk was sent to fight the Abomination, while Qnax and his allies, now calling themselves the Horror Hunters, went after the Galaxy Master itself. The Hulk's power increased with his rage until he was powerful enough to once again overcome the Abomination. Fearing the relentless power of the Hulk, but still seeking to provbe himself to his master, the Abomination attacked and easily overpowered Qnax, who's loud and boastful mouth drew his attention. Qnax was out for the remainder of the fight, which resulted in the destruction of the Galaxy Master and the defeat of the Abomination. (Incredible Hulk II#472 (fb) - BTS) - Qnax learns humility in his travels, and decides to recover the Ultimate Machine to help his people, regain the favor of his government, and be reunited with his life-mate and offspring. (Incredible Hulk II#471-474) - Qnax recruits Bruce Banner to help him recover the Ultimate Machine. The two of them travel to the Leader's former base, where they rebuild the machine with which the Leader had sent the Hulk to Watcherworld. They take the journey, but an energy field around Watcherworld diverts them to a nearby planet of the Bidoceros. Unknown to all, Xecu the Watcher is currently stationed on Watcherworld, and is mourning the loss of his life-mate. The Watcher's anguish is transmitted to the Bidoceros, resulting in nightmares, madness, and even war amongst the normally peaceful race. Qnax and the Hulk are separated by a few days during the transmission, and Qnax arrives to find the Hulk affected by the Watcher's anguish as well, slaughtering the helpless Bidoceros. Qnax calms the Hulk, and they communicate and join forces with the Bidoceros. The Bidoceros gave them a ship to arrive on Watcherworld, and they convince the Watcher to allow them to have access to the Ultimate Machine. Both Qnax and the Hulk had separate experiences within the machine, but Qnax learned the truth that the Council had sought not order, but power, and he was only a dupe of them. The Watcher sent Qnax back to Xantar, where he hoped to become a true champion of his people, armed with his own sense of justice. Comments: Created by Stan Lee (writer), Jack Kirby (pencils), Bob Powell (inks). Amphibion received a profile in All-New Official Handbook of the Marvel Universe#1.